From the Hancock County Courthouse, go northeast for 2.6 miles on Hwys 22/15 to the Hwy 22/15 split. Turn right on Hwy 22 and travel 4.8 miles to Covey Rise Farm Rd. Turn right and follow Covey Rise Farm Rd for 4.5 miles until it dead ends into Powelton Church Rd. Turn right and go 0.5 mile to the cemetery on your left behind the church. 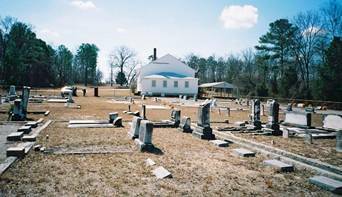 Originally Fulsoms Creek Church, which was organized in June 28, 1792. The church was renamed Horeb Baptist Church in 1798. The church moved to its present site in 1799. As was the custom in Georgia before the Civil War, blacks attended regular church services with whites. 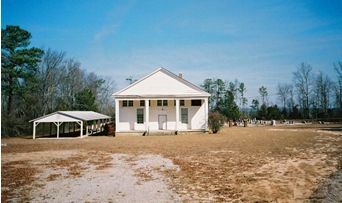 In 1870, the minutes record that the members were helping their African American brethren build their own meeting place, which became Union Church. After serving the Mayfield community and surrounding area for 200 years, Horeb Church ended its regular services in 1992. Trees planted by the congregation in 1886 still line the driveway to the church and cemetery. Lots are numbered starting with Lot 1 in the front right as you face the front of the church. Numbering goes in rows from front to back, then back to font, then front to back again, in a back and forth pattern. Lot 38 is at the back center of the graveyard. Lot 56 is at the front left. Last name does not end in 's', despite other graves in this plot ending in 's'. Gravestone reads "CPL Charlie Lyons". On same gravestone as Hattie Lou J. Lyons. On same gravestone as Sidney Lyons. Stones at the head and foot mark the grave. On same gravestone as Inez W. Whaley. On same gravestone as Forest Whaley. d/o J. W. & Anna Whaley. Maiden name of Whaley from obituary. s/o J. W. & F. R. Allen. Gravestone has a harp with a musical score. On same headstone as Florence Archer Allen. On same headstone with John W. Allen. Woodmen of the World On same gravestone as Pauline Whaley Brantley. On same gravestone as Carlos Ivey Brantley. On same gravestone as Maude Brantley Jones. On same gravestone as John William Jones. On same gravestone as Bernice A. Brantley. On same gravestone as Asbury D. Brantley. On same gravestone as Virginia Lee Griffin Brantley Smith. On same gravestone as A. D. Brantley. "Thy rod and thy staff they comfort me" were her last words. First name unreadable and is assumed based on Kimbrough list. Dates per Kimbrough. Is a vault which is no longer readable. 3 graves for certain and 1 possible grave marked by stones. "Mother" On same gravestone as Thomas J. Allen. On same gravestone as Elizabeth McDermon Allen. d/o Joel P. and Amanda Reynolds. F.C.P. CD. A 327 Inf 82nd. "Father". On same gravestone as Amanda Allen Reynolds. On same gravestone as Joel P. Reynolds. "Father". On same gravestone as Elizabeth Reynolds Allen. On same gravestone as Parham Allen. "Son" No death date as of May, 2002.
s/o Mary and Sterling Wells. On same gravestone as Thomas W. Meighan, Sr.
On same gravestone as Ella R. Whaley. On same gravestone as William T. Whaley. Age 5 mos. Infant of W. T. & E. B. Whaley. "In heaven there is one more angel." On same gravestone as Edith Whaley Myers. On same gravestone as Newton Collie Myers. No last name on gravestone. In a lot connected to Charlie and Della Nora Wheeler. Possibly their daughter. On same gravestone as Della Nora Wheeler. "Father" Age 74 years. On same gravestone as M. E. Cochran. "Mother" "Gone but not forgotten" Age 43 years. On same gravestone as W. D. Cochran. d/o C. A. & Ida Hill. s/o C. A. & Ida Hill. d/o S. L. & M. J. Pattillo. "My sweet child ...We miss thee in the sweet by & by...Papa"
Only son of S. L. & M. J. Pattillo. "Was drowned". "We miss thee dear Henry, but trust you are with Jesus, watch and waiting for Papa, Mama, Sister"
"Little babe the light of the day you never held, but now thou art a cherub in the light and glory of eternal life." No name, only a "P" on a footstone. Infant d/o S. L. and M. J. Pattillo. "But short was the stay upon earth, in the arms of Jesus thou art resting." Written on fence around Pattillo lot. Reads "Family of H. T. Humphrey" and has one grave marked by an unreadable funeral home tag. Age 19. "A precious one from us has gone - a voice we loved is stilled - a place is vacant in our home, which can never be filled." s/o J. T. & M. E. Whaley. "Sleep precious darling. Sleep not in thy cradle bed, not on thy mother's breast but in thy savior's arms." "Sleep on, my own true love"
s/o C. P. & J. B. Whaley. "Sleep on our own little darling thou art with Jesus and his angels"
"Another link is broken in our household band. But a chain is forming in a better land." w/o J. T. Whaley. "She was a kind and affectionate wife, a fond mother and a friend to all." Sgt. Company D, 5 Ga. Inf. 2 child graves and 3 other graves, probably adults. "Beloved wife of Ralston H. Kinsey"
"She welcomed death not only as a release from bodily suffering but as the fruition of her hopes of eternal happiness"
w/o Dr. George R. Pattillo. "Here lies one who in this life was a kind mother, a true wife, She was by many virtues blessed and piety among the best"
d/o Dr. G. B. & Lydia Pattillo. "Borne to heaven by angels"
"Little Mattie d/o W. F. & Mattie Smith". d/o W. F. & Mattie Smith. "In heaven there is one angel more." "You are not dead to us, but as a bright star unseen. In loving memory of my husband"
w/o T. J. Wheeler, Sr.
s/o Irby and Myrtle Stewart. s/o I. D. & M. H. Stewart. d/o Irby and Myrtle Stewart. Co. I 49 Ga. Inf. Age 49 years and 12 days. "He was a member of Baptist Church for more than 20 years and adored that profession by a godly walk and conversation...."
Stones at head and foot. s/o Thomas and Susan Whaley. w/o Thomas Whaley. "To the memory of Mrs. Mary Whaley". "Mother". On same gravestone as Thomas H. Wheeler. "Father". On same gravestone as Gussie B. Wheeler. Sister of Clara B. Wheeler. w/o Jesse Mercer Reynolds. "He givetheth his beloved sleep"
"Sweet angel boy thou wert not given long here to dwell from earth's rude blast." s/o J. M. & M. C. Reynolds. s/o J. M. & M. C. Reynolds. "This lovely bud so young and fair called home by early doom just came to show how sweet a flower in paradise would bloom." Age 64 years. w/o John Reynolds. d/o H. A. & M. B. Whaley. "Our darling daughter"
On same gravestone as Kinchen M. Hall. H. as middle initial appears on gravestone. Middle name from funeral home marker. On same gravestone as Louise W. Wheeler Banta. On same gravestone as Arthur H. Banta. "Faithful to his trust even unto death"
w/o B. P. Humphrey. "Mother, thou hast from us flown to the regions far above. We, to thee erect this stone consecrated by our love." "Father" Gravestone matches style of Delanie Sharpe and John F. Sharpe. "Mother" Gravestone matches style of James L. Sharpe and John F. Sharpe. Grave is marked by a stone. On same gravestone as Eva Beckum Andrews. On same gravestone as M. Pride Andrews. Under same headstone as Welborn Guy Beckum. Under same headstone as Susie Wells Beckum. Under same headstone as Daniel F. Beckum. On same gravestone as Susan W. Ledbetter. On same gravestone as George W. Ledbetter. "Sleep on sweet babe and take thy rest. God called thee home. He thought best." Last name of Ledbetter assumed, since grave is within the Ledbetter lot. s/o B. F. and Sophronia Jordan. On same gravestone as Lillian J. Humphrey. On same gravestone as Miller D. Humphrey. On same gravestone as Sara Jones Armstrong. On same headstone as Sam Harris Armstrong. Woodmen of the World memorial. "At rest"
"Together forever" On same gravestone as Nellie Chafin Jones. On same gravestone as Omer Lias Jones. On same gravestone as Doris J. Rowe. On same gravestone as Palmer W. Rowe. "At rest". No death date as of May 2002. On same gravestone as Evelyn J. Green. On same gravestone as Truman Curtis Green. No death date as of May, 2002.
m. May 19, 1951, Anna Ruth Johnston. m. May 19, 1951, William Henry Jones. No death date as of May, 2002. On same gravestone ad Lucius Murrah Carr. On same gravestone as Minnie Warthen Carr. Infant s/o Mr. & Mrs. W. E. Carr. "Sorrow and sighing shall flee away - Isaiah 35:10"
On same gravestone as Alice Brantley Lanterman. On same gravestone as Ralph Wayne Lanterman. Under same headstone as Edith B. Griffin. Under same headstone as Binion Griffin.